No matter how healthy and diverse of a diet you have, you are most likely missing out on some key vitamins, minerals, and amino acids. I highly recommend that you invest in a Multi Vitamin product to take daily if you don’t currently. I recently bought the somewhat new “Anavite” multi vitamin product by Gaspari Nutrition (company that makes SuperPump Max) and thought I would do a quick Anavite review for it. I’m just finished up my first of two bottles of Anavite, but I have a pretty good feel on the quality of Anavite – enough to give a thorough review for those interested in purchasing a Multi Vitamin. So what is Anavite? Anavite isn’t your basic cheap multi vitamin product. The Gaspari team has created an “ultimate performance enhancing” multi vitamin, which contains ingredients you won’t find in your everyday multi vitamin product. Anavite includes all of the basic vitamins and minerals, but have also added in high doses of Beta-Alanine and L-Carnitine L-Tartrate. If you’re new to my blog, welcome. I only do honest reviews of supplements unlike some other websites out there. I use every supplement I review myself before writing up the review and will point out all pros and cons I have found by using the supplement. I’ve taken dozens and dozens of supplements over my years of training and have a good feel for each product I take. I will come right out and tell you that I REALLY like Anavite, and might make it my go to Multi Vitamin supplement now. Prior to Anavite I had been using Animal Paks (made by Universal who makes Animal Test). Animal Paks is also a great multi vitamin product (priced similar), but it doesn’t include the Beta-Alanine or Carnipure ingredients that Anavite includes. I am huge on Beta-Alanine, and I believe it will be a staple in a lot of supplements. It is an amino acid, and studies have shown that it reduces lactic acid allowing you to lift more weight or more reps before fatiguing. 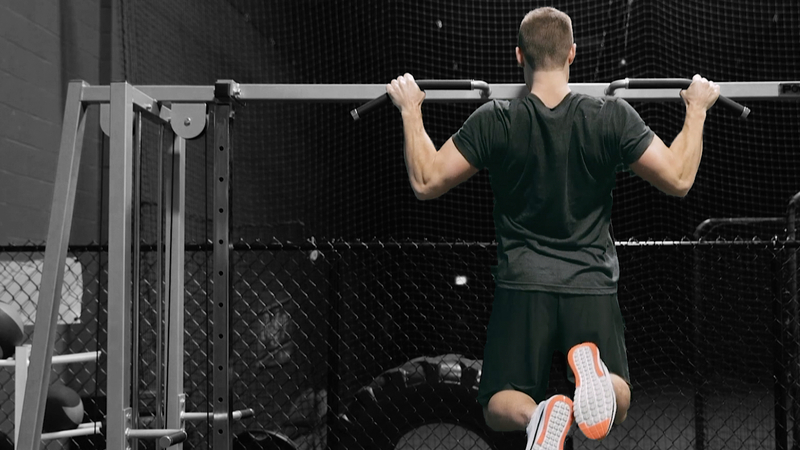 Great for muscle building, endurance, and fat loss. Since taking Anavite I’ve felt like my fat loss has come quicker than normal when I’m trying to cut some fat. I also feel very energetic in the gym, and my workouts have been great. I take my first dose of Anavite about 2 hours before my workout, and my second right after with my post workout shake. There isn’t much you are going to actually feel in a normal Multi Vitamin, but with Anavite I think you can actually feel the extra boost (most likely the beta alanine doing its thing). No side effects to report for Anavite. I don’t think you will find a multi vitamin product that has any side effects. Oh and I guess I should mention (its on the bottle) if you haven’t taken any Beta Alanine supplements you will most likely feel a tingling feeling from the Beta Alanine for about 15 mins after the supplement gets absorbed in your body. This is nothing to worry about and will go away after about a week. Also be sure to read the warnings on the labels (like you should for all supplements). Is Anavite For Men or Women? Both. It is a great all around multi vitamin, and I would recommend it to both men and women over 18. Whether your goal is fat loss or muscle gains Anavite will help you meet your goals. How much does Anavite Cost? 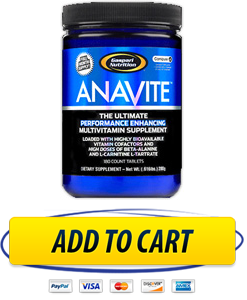 Anavite retails for about $50 BUT you can get it cheap at Bodybuilding.com – only $30 for a months supply. If you could choose just one supplement to spend your money on I would recommend a Multi Vitamin, and why not get one of the best Multi Vitamin products out there for just $1 per day? I hope you enjoyed my Anavite review. It really is a top notch supplement and I highly recommend it… click here if you want to buy it cheap.